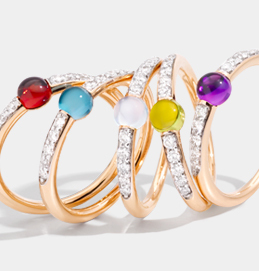 Loyal to the finest Italian goldsmith tradition, Pomellato creates top quality jewellery in a constant quest for the perfect mix between creativity, stylistic consistency, innovative technology and craft skills. 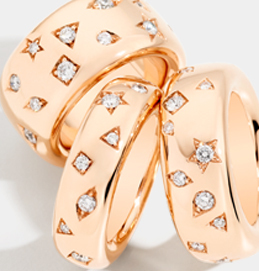 Pomellato jewels are made in yellow, white and rose gold, and alloys have a 750/1000 title. A jewel worn even every day with care will only occasionally need exceptional maintenance, especially if it is delicately cleaned from time to time and put away appropriately. The lustre of jewels, especially gold jewels (without gemstones or diamonds) can be maintained in a simple way using specific, non-abrasive products specially meant for cleaning jewellery. Most products available on the market for jewellery cleaning may be used safely, as long as they are properly applied, though it is advisable to take extra care with products containing ammonia, alcohol, acids or chemical substances that may prove to be too aggressive. For a number of reasons, the cleaning process may be more risky for jewellery set with gemstones or diamonds; thus, it is advisable to turn to professional cleaning. A good habit in order to preserve your jewels is to place them separately in individual soft and clean sachets or cases, in a dry place, away from heat sources and generally sheltered from any agents that could damage them. Sandblasting, like rhodium-plating, is a surface finish that tends to alter with wearing. Sandblasting, in particular, is a treatment that enhances the superficial roughness of objects, creating peaks and troughs that can be seen and felt when touching. Wearing a jewel will tend to smooth out these peaks and troughs over time, and the surface becomes more glossy. However, the sandblasted finish can be easily restored. Jewels in white gold may tend with time to turn yellow. It is a well-known phenomenon, characteristic of white gold alloys, that in some cases may be accelerated by reactions to external agents. However, since it is only on the surface, it can be avoided or easily overcome by periodical cleaning with purpose-made products. However, if the jewel is rhodium-plated, the yellowing may be the result of the loss of lustre of the cold component of the rhodium-plating process and thus the emerging of the warmer colour, characteristic of the natural white gold alloy. In any case, also rhodium-plating is a surface treatment that can be easily restored. The term ‘hard stone’ is improperly used to designate semi-precious stones, so as to distinguish them from more precious stones like sapphires, rubies, diamonds, etc. All gemstones are classified according to different indexes, one of which is the hardness index, specifying the level of resistance to scratching and chipping. Gemstones traditionally used in jewellery generally have a high hardness index, but it goes without saying that, as hard as a gemstone may be, it is not necessarily indestructible, and a gemstone set in an item of jewellery will still be delicate. Even small knocks, though not deliberate or direct, may scratch or chip a gemstone. Diamonds themselves, which are famous for being the hardest stones in nature, are not immune to breaking. For all of its jewels, Pomellato chooses exclusively natural gemstones carefully selected by expert gemmologists according to strict quality standards that Pomellato applies as a guarantee to its products. Natural stones do not need any particular treatment or maintenance but, being delicate, they must be properly cared for to avoid knocks that may chip or break them, as well as contact with external agents that may attack them. A good rule of thumb would be to avoid contact with cosmetic products, fragrances, soaps, detergents, chlorine or chlorinated water, prolonged exposure to the sun, proximity to heat sources and sudden changes in temperature that may damage the surface of a gemstone irreversibly. The re-sizing of a ring – also depending on the difference between the starting size and the end size requested – is often a very delicate work that could undermine both the structure and the appearance of the ring, especially for styles where natural stones are exposed. To protect its products and customers, the Pomellato re-sizing service meets strict qualitative standards, and entails an estimate for fully remaking the ring whenever re-sizing is judged unfeasible. For the re-sizing of a ring, as is generally the case for any after-sale activity, it is highly unadvisable to turn to unauthorised laboratories which do not know the manufacturing process in detail, and are thus highly likely to damage the jewel. Damage from contact with mercury, caused for instance by the accidental breaking of a thermometer, is the most severe damage a jewel may suffer – and, unfortunately, in most cases it is irreversible. Mercury creates an amalgam with gold, and often jewels cannot be repaired. In order to restore the original state of a jewel, as a first step it is fundamental to remove mercury. This can be done only with a high-temperature process which is highly toxic, since mercury vapours are extremely toxic. At the end of the treatment the jewel surface becomes extremely porous, making it unlikely for the original appearance of the jewel to be restored. Moreover, the colour of the alloy will differ from the initial one, since it is very difficult to remove mercury completely. How are Pomellato 67 jewels made? Pomellato 67 jewels are made using natural untreated silver, and the silver alloy used has a 925/1000 title. A jewel in natural untreated silver, worn even every day with care, will only occasionally need exceptional maintenance, especially if it is delicately cleaned from time to time and put away appropriately. Normal everyday use and external agents such as atmospheric humidity, temperature, pollution levels, contact with cosmetic products and perspiration may dull the lustre of silver surfaces, or alter the original appearance of the surface finish present in some items. The phenomenon whereby silver lustre is dulled and the surface becomes darker and more opaque, scientifically known as “tarnishing” and commonly called oxidation, is well known in metallurgy. The extent and speed of this phenomenon cannot be predicted, since they depend on a number of factors. To keep the oxidation problem under control and reduce it, the general rule is to prevent silver jewels from coming into contact with detergents, creams, fragrances and water, in particular swimming pool water (chlorinated) and sulphur springs, and it is advisable to regularly wipe the jewel surface gently with a soft cloth, being particularly careful with the finish and gemstones, if present. In case of jewels with gemstones or surface finishes, like burnishing, particular care is needed and it is safer to turn to professional cleaning, whereas the lustre of all silver jewels is more easily preserved by using specific silver cleaning products, as long as they are not too aggressive. And finally, to preserve your jewels, it is a good idea to store them separately in individual soft and clean sachets or cases, in a dry place, away from heat sources and generally sheltered from any agents that could damage them. Some Pomellato 67 jewels have part of their surface burnished. The burnished effect is the result of a treatment that involves a limited thickness of the surface; thus, the surface aspect can change with use, in particular in the most exposed areas of the metal. To preserve burnishing as long as possible without risking removing it, care must be taken not to wear out the burnished parts and, more than anything, not wipe them with normal or polishing cloths, or other products specifically intended for silver. To restore surface finishes like burnishing, a specific process must be applied. Marcasite is a mineral of a light bronze yellow colour, with a metallic sheen. In the Pomellato 67 collection, marcasite (Raw material utilised: pyrite) was used to conjure up the ancient, romantic character of a traditional material rediscovered and re-interpreted in bright pavés with a dark allure. The name marcasite was used mainly by the Arabs, who associated it with the fascination of fire. Historically, the first fragments were found inside Inca tombs, while the material started to be used in jewellery in the middle of Queen Victoria’s reign. 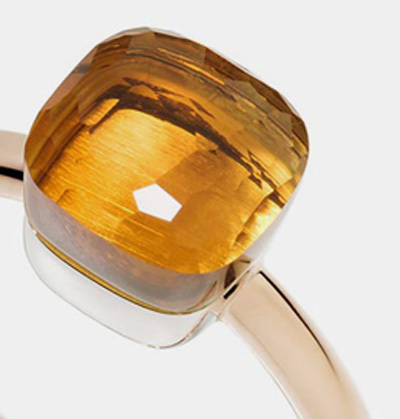 The hydrothermal synthetic quartz used in the Pomellato 67 collection is a synthetic gemstone, resulting from a crystallisation process obtained in a lab, in a shorter time than in nature. Synthetic quartz has the same chemical composition of natural quartz; thus, though made artificially, the process mimics the same conditions that exist in nature and the stones have the same properties as the raw natural stones (colour zoning).